At Blue Peaks we are proud to offer you more than just a motel room – located just a 5 minute stroll from Queenstown’s shops, restaurants and nightlife, you have the freedom to enjoy the peaceful surroundings with everything you need at your doorstep. We have thought of everything we can to make sure our guests have a wonderful stay in Queenstown. Bus Stops: Ski field and airport transfers are located conveniently right across the road from us. Pets: Pets are not allowed but please speak to us about any accessibility animals. Environment: We are very proud to have been awarded the Qualmark Enviro-Silver badge, This recognises our commitment to the beautiful environment of Queenstown and ensures your comfort in a clean, carefully maintained property. WIFI DATA: A complimentary internet WIFI code is given to you on arrival. We welcome children and children under 5 years stay free when using existing bedding. One child under 2 years stays free in a cot and we also have highchairs available. Older Children/Adults are $25 Per Person, Per Night when using existing bedding. Rollaways are not provided. Cots, Highchairs & Babysitting Services are available, just ask our friendly Reception staff when booking your stay. 100% of the total reservation amount will be charged at the time of booking online. All transactions are in New Zealand Dollars. Cancellations or changes to bookings can be made up to 24 hours prior to the check-in date. Cancellations within 24 hours incur a charge of the first night’s stay. All online bookings will be charged to credit card details, advised at time of booking. Any extras ie. extra person not advised at time of booking or amendment to room type after original booking has been made, will be paid for by guests at time of check-in. There is a $30.00 administration fee to cancel your booking up to 24 hours prior to your arrival date. In the event of late cancellation or no-show a charge of one night’s tariff will apply. All online booking refunds can only be made to the credit card debited for the original transaction. We accept all major credit cards. Prices are subject to change. Please check at the time of booking. Since 1975 Blue Peaks has caught the eye of every traveller that has passed its iconic blue lights. Reflecting the mountain peaks that surround Queenstown, Blue Peaks’ original aim was to offer choice and value in an under-developed motel accommodation market. Locally owned by innovative tourism company Skyline Enterprises, Blue Peaks quickly established itself as one of the friendliest places to stay in town. Queenstown has boomed since then but the values of Blue Peaks haven’t changed one bit. 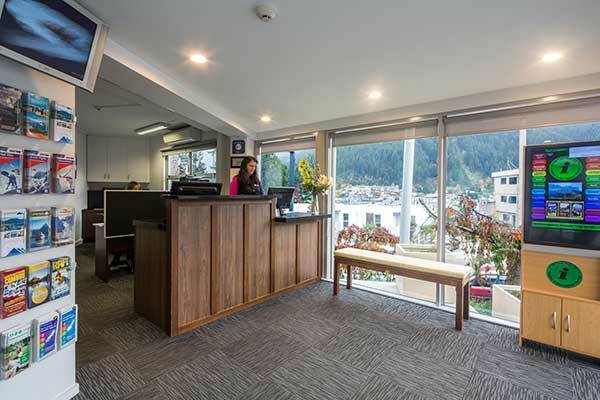 Despite expansion and the addition of the Blue Peaks Apartments they are still proud to be locally owned and to offer travellers to Queenstown a freedom and a value for money that goes beyond the standard. Above all they still believe in a level of service which means that every guest is welcomed as a friend and is celebrated for making the long journey to Queenstown, New Zealand; the adventure capital of the world. 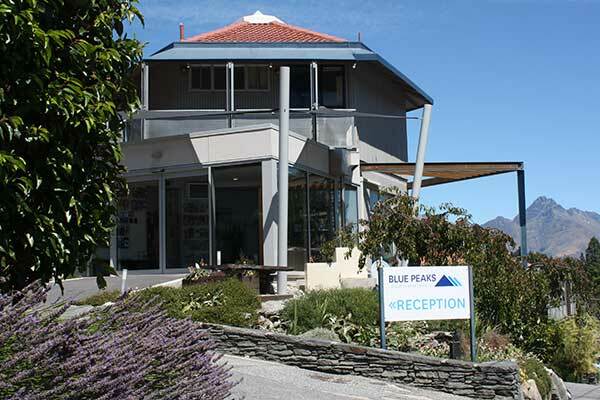 Blue Peaks Lodge & Apartments is managed by a hard working team of staff who provide local New Zealand hospitality with a smile! Managed by Anne & Michael McMillan with support from Char, Janelle, Shona, Jan and Linda you will find that staying with us is easy and gives you the freedom to discover the real Queenstown. We can’t wait to show you the town that we know!